Few industries are as dependent on long-lasting, sanitary flooring as the healthcare & medical industry. Healthcare & medical flooring systems must be designed, formulated and installed to accommodate highly demanding, 24/7 environments. The patients and healthcare professionals in your facility depend on medical flooring systems that discourage dangerous bacteria. Florock offers healthcare flooring systems and concrete epoxy floor coating formulas that are made specifically for environments like hospitals, medical centers, therapy facilities, assisted living homes and more—all places where sanitation is a high priority. 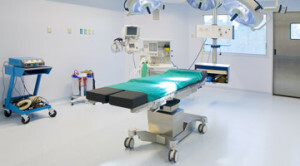 Our flooring options are ideal for operating theaters, corridors and any location where enduring sanitation is important. The concrete epoxy floor coating and other formulas offered by Florock offer long-lasting resilience to heavy foot traffic and other activity characteristic of healthcare facilities. These flooring systems are durable enough to withstand the weight of heavy medical equipment, the dragging and rolling of gurneys and wheelchairs, the 24/7 foot traffic of doctors and patients, and the accidental dropping of sharp medical instruments. Your facility can’t afford to slow down, so our healthcare & medical flooring systems are formulated for convenience from the moment we install. We offer fast-curing products, and our healthcare floor coating solutions don’t require waxing or polishing, so you can drastically reduce your maintenance time while keeping a clean, stain-free floor. 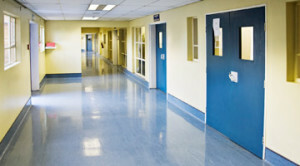 Medical office flooring must stand up to a high level of ongoing foot traffic and other harsh conditions. It needs to be puncture resistant and antimicrobial for optimal safety and sanitation, and should also be resistant to solvents and other strong cleaning chemicals to avoid having repeated exposure compromise the floor’s integrity. High performance flooring such as Floropoxy Novolac, FloroCryl Chip, Florotallic, and other systems can all contribute to the safety and aesthetics of a medical office’s flooring, and can be customized to match the atmosphere of a pediatrician’s office, urgent care clinic, dental office, and more. No matter the color scheme, our high performance designer selection can support and enhance your design. Our floors can be installed to match any decor, including custom colors, floor patterns and markings that make it easier to direct traffic, separate work stations and locate dropped instruments.